This 4-piece custom lighter set is the perfect gift for the Celtic collectors in your life. 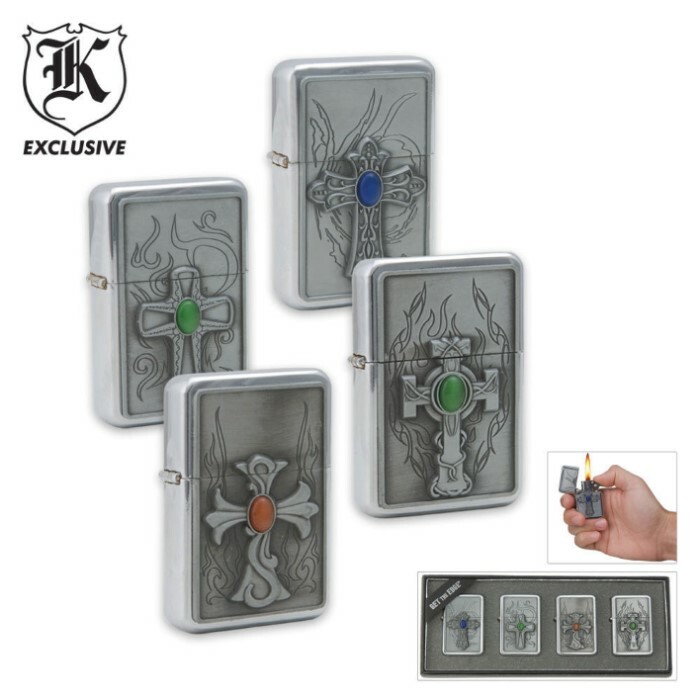 Each satin-finished windproof lighter offers a different style cross with a different color jewel in the middle of each. Carry a separate lighter almost every day of the week! Packaged in attractive gift box.Not Zippo brand. I got this set for a girl that collects cigarette lighters, she quit smoking I am glad to say but has quite a collection of them! These are great lighters as were the biker set I got her and the Nazi lighters. They look like a Zippo and the only way you can tell they're not a Zippo is to turn them upside down and read the bottom. You can flip the lid and do all the neat tricks with them that you can do with a Zippo and they light up just as well! Less than a third the price of four Zippos, what's not to like? Give one or two to a friend, put one in your day pack for camp fires, and one in your survival gear. Get a can of lighter fluid at the nearest drugs store and you're set to go. Happy trails. I got this four pack for me and my closest brothers because im extremely symbolic like that..I haven't gotten them yet to give a great review but so far by look alone they seem great. these are great they look nice great size real sturdy and durable i always drop them i have butter fingers and people always notice.